Diddy Kong Racing for the N64 was never able to escape that long shadow cast by Mario Kart. While the game got a remake for the DS, it never got a true successor. And if we’re being honest, it probably never will. Fortunately there’s a fan video to help fill the void left by its eternal absence. CryZENx is an artist and programmer who loves to remake his favorite Nintendo characters using Unreal Engine 4. We’ve featured a number of his videos in the past. 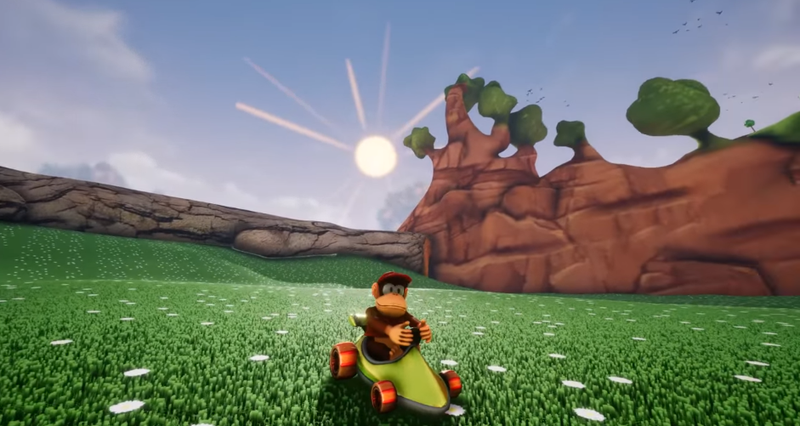 Over the recent holiday, he released his latest project: a short demo of Diddy Kong driving around fields and caves inspired by Diddy Kong Racing. Donkey Kong Racing, a sequel to the original game planned for the Gamecube, ultimately got canned. Then Microsoft bought Rare. After the DS port failed to jolt the masses into proper exultation, we all assumed the spin-off series is dead. As CryZENx’s works shows, though, a future Diddy Kong Racing could look totally rad. Whether it plays great or is fun is another matter altogether, but honestly when did Donkey Kong games ever need to be good to satisfy fans? You can see more of CryZENx’s work at his channel where you can also find a demo of his Diddy Kong racer available to test drive.